Dr. Caldicott, Prof. Mousseau discusses his research, which suggests that many species of plants and animals suffer from increased mutational loads as a result of exposure to radionuclides stemming from the Chernobyl disaster. Of interest, read the August 13 article Chernobyl: The Gift That Never Stops Giving. Also see the BBC slide show, Working in the Chernobyl ‘zone of alienation’. Prof. Mousseau describes how he became interested in studying the effects of Chernobyl. He then lays out the geographic scope of the area affected by the Chernobyl meltdown, variations in radioactivity readings in different regions, and which radioactive isotopes are found in the “isolation zone”. 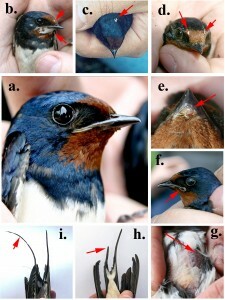 Next, he gives an overview of his studies on barn swallows in the contaminated areas, many of which show unique and unusual abnormalities not previously seen. He talks about the other bird populations that have dropped off dramatically. Prof. Mousseau says his group has also studied insects and has done some preliminary research on mammals in Belarus and the Ukraine. He describes how critics tried to fault his research. Dr. Caldicott asks him to extrapolate from Chernobyl’s effect on birds and animals to the accident’s effect on humans. She mentions the recent book which brings together 5,000 reports from Russian doctors and scientists, Chernobyl: Consequences of the Catastrophe for People and the Environment. Listen to Dr. Caldicott’s interview with Dr. Janette Sherman, who translated the reports for the New York Academy of Medicine. Dr. Caldicott asks Prof. Mousseau to comment on the book’s finding that one million people may have died as a result of the Chernobyl meltdown. He notes the recent report in the journal Pediatrics by Vladmir Bebeshko about lowered life expectancies in the Ukraine and Belarus, and also the 2006 report, Health Effects of the Chernobyl Accident and Special Health Care. Dr. Caldicott inquires about the lack of research by major organizations on the human populations affected by Chernobyl, and the “conspiracy of silence” by the international Atomic Energy Agency (IAEA) which states that only 50 people died as a result of the meltdown. Prof. Mousseau talks about why the research by the IAEA, which ignored the Eastern European scientific literature documenting Chernobyl, is lacking. He points to the 30 studies he has helped compile in the last 10 years, and praises the work of Chris Busby, who studied leukemia rates among European children and Chernobyl. Prof. Mousseau stresses how much more research must be done on the human and animal population in Russia to fully document the continuing effects of Chernobyl. For more information, visit Mousseau’s Web page. Read Dr. Caldicott’s books Nuclear Power is Now the Answer (2006) and Nuclear Madness (1994) to more fully understand the health effects of radiation and the worst-case scenario of a meltdown at any of the 103 U.S. plants. See the report by the Union of Concerned Scientists, Chernobyl on the Hudson, to learn how a meltdown would permanently contaminate New York City. View other reports about Chernobyl and the health effects of nuclear radiation on this Web site’s Reports, Studies and Conferences page (scroll down to the ‘Nuclear Power’ section). Dr. Caldicott gave in March 2010 at St. Michael’s College in Vermont, entitled “In our Backyard, the Health Risks of Nuclear Power. She tells the audience she will walk them “through the medical implications of the nuclear fuel cycle starting with uranium mining.” In her remarks, she mentions her book Nuclear Power is Not the Answer. The excerpt also includes the problems of nuclear proliferation and the continuing threat of nuclear war between the U.S. and Russia. This entry was posted on Monday, August 16th, 2010 at 12:00 am	and is filed under Uncategorized. You can follow any responses to this entry through the RSS 2.0 feed. Both comments and pings are currently closed.